The primary artillery piece of the Afghan Army is the 122-mm Howitzer D-30. The Afghan National Army (ANA) is fielding the D-30 as its' primary artillery piece. Each ANA brigade has 6 - 8 guns depending on its tashkil. These guns are usually part of the combat support kandak designated as the 4th Combat Support Kandak (CSK). The D-30 is complemented on the battlefield with the ANA M224 60-mm Mortar and 82mm Mortar. Ammunition for the D-30. The howitzer fires the 122-mm round (see Dunarit webpage for more info on ammunition here).The rate of fire is 7-8 rounds per minute (maximum) and 1 round per minute (sustained). Characteristics and Specifications of D-30. It requires a crew of about 7 members.The artillery piece is a towed field gun with a maximum range of 15 kilometers. The gun can be fired in 360 degrees from its position and can be fired in an indirect or direct mode. 3. Where Does Afghanistan Get the D-30s? Sixty of these weapons were provided by the Army Forces of Bosnia and Herzegovina. There may be other sources for the D-30s as well. The U.S. is fielding 194 D-30s in conjunction with some European nations through the offices of Picatinny Arsenal. 4. Afghan Artillery Training. The Artillery Branch School of the ANA (referred to as the School of Artillery or SoA) was opened at the Kabul Military Training Center (KMTC) in late 2010.1. In addition, some regional artillery training centers are now open with ISAF and ANA instructors providing the training. These regional training sites are aligned with the ANA corps or the Regional Corps Battle Schools. Forward Observer Training. Forward Observers or FOs are an integral part of the fires process. The FOs call in fire missions to the Fire Direction Center (FDC). FOs require specialized training on tasks such as land navigation, map reading, Global Positioning System use, and basic indirect fire observation training that allows them to call for, observe and adjust artillery fire. 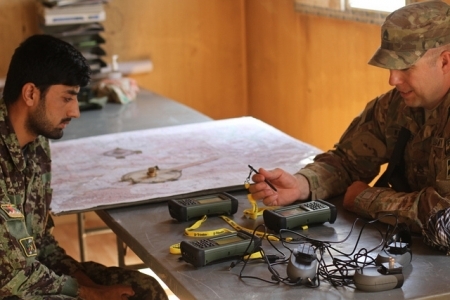 A Fire Support Officer (FSO) with a Security Force Assistance Advisor Team (SFAAT) provides training and instruction to ANA soldiers in a course for Artillery Observation. (U.S. Army photo by SGT Manuel Noriega, 6 Jan 2013). Call for Fire Trainer (CFFT). There are a number of CFFTs located throughout the country but they are plaqued with technical issues. Afghan Fire Direction Center (FDC). 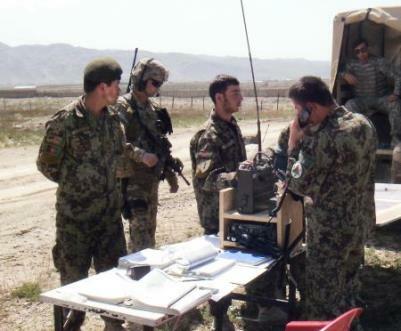 The Afghan FDCs, which are found in the Artillery Battery of the Combat Support Kandak of ANA brigades are slowly becoming proficient with computing fire mission data in response to calls for fire from Afghan forward observers. The communications equipment is present; however, sometimes the calls for fire come by cell phone. Lack of Up to Date Afghan Maps. One problem common among Afghan Fire Direction Control Centers (FDCs) are that they are using old maps, some without grid lines. There are efforts underway to get the ANA map producing capability up and running; 6. however, there is no evidence that the ANA G2 will have the capability to produce and distribute the maps to the end users in the near future. Unfortunately, the U.S. National Geospatial-Intelligence Agency (NGA) will not provide maps that are "Unclassified" or "Releaseable to Afghans" - reportably to force the Afghan mapping entities 5. to provide an "Afghan sustainable solution" for the logistical provision of maps to Afghan National Army. While from a "top down" perspective this might yield an Afghan mapping organization able to provide maps to Afghan FDCs in 2018; it does nothing to ensure that Afghan artillery units are providing accurate, effective fires on insurgents in the now or in next few years and to reducing civilian casualties (CIVCAS). Many artillery advisors and SFAATs are applying a dose of common sense to solve this self-inflicted problem area. Afghan Gunnery Computer (AGC). 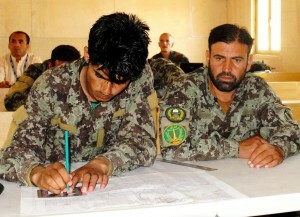 In addition to manually computing firing solutions the ANA are now being issued and trained on the Afghan Gunnery Computer - called AGC for short (at least the coalition trainers call it that). Not all Afghan artillery units have the AGC and the meterological data may not be updated which affects the firing solution. In addition, for some strange reason, the Coalition decided not to provide a maintenance program and software updates for the AGC. How are Coalition and U.S. Trainers Learning about the D-30 Howitzer? For many coalition artillery trainers finding out about the D-30 is discovery learning. Some European Military Advisor Teams (MATs); especially those from the former Soviet bloc countries such as Bulgaria, Poland, Czech Republic and others are familiar with the D-30. Some U.S. instructors receive training on the D-30 from NATO countries that use the D-30 while others receive familiarization at Picatinny Arsenal . 2. Many coalition instructors are self-teaching themselves and then applying that knowledge to training up the Afghan artillerymen. 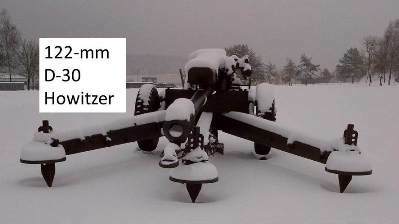 Picatinny Arsenal is also involved in the acquisition of D-30 ammunition and can provide instruction in D-30 maintenance. JRTC at Fort Polk can familiarize advisers with the D-30 but the installation lacks equipment such as aiming circles and other necessary equipment to conduct adequate training. JMRC in Hohenfels, Germany has a full complement of equipment for the D-30 to prepare D-30 advisor teams for their duties in Afghanistan - although (unfortunately) not all artillery advisor teams cycle through JMRC. 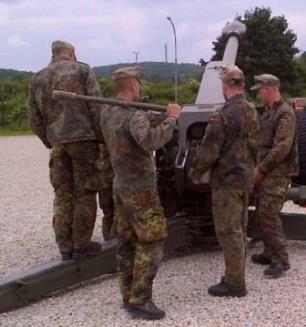 A German Military Advisor Team (MAT) trains on the D-30 122mm Howitzer at Joint Multinational Readiness Center (JMRC) in Hohenfels, Germany prior to deployment to Afghanistan. Most MATs have their first exposure to the D-30 during a rotational training exercise prior to deployment. The D-30 is a simple and rugged artillery piece that saw long service in the Soviet Army as well as other Soviet bloc countries. This towed artillery piece stands up well in the harsh terrain of Afghanistan. Sights for D-30 122mm Howitzer. There were some intial problems in the fielding of the D-30 to the Afghan Army. Some howitzers had the older 6,000 mil sights while others had the 6400 mil sights. This caused a huge disconnect in the fielding and training of the ANA artillery units. Some Afghan D-30 Howitzers are set up for 6,000 mils while newer howitzers are set up for 6,400 mils. The sights may be 6,000 or 6,400 mils. If there is a mismatch then the ANA artillerymen have to make adjustments to their computations by doing a little math. In addition, there are cases where 6000 mils sights have 6400 mils scales. In photo at left an ANA Soldier makes adjustment to the D-30 Howitzer sight in preparation for a fire mission in Kunar province in January 2013. Afghan Army Artillery Master Gunner. The Afghan artillery units are slowly becoming more capable. One contributing factor is the ability of the Afghans to internally train and certify their own soldiers to fire artillery. Afghan field artillery master gunners are the subject matter experts in all aspects of the D-30 howitzer. They advise the kandak commander on the weapon system capabilities, limitations, and employment. The master gunners manage and execute all artillery certifications and qualifications programs and develop new training techniques to improve crew training within the unit. The Afghans use the U.S. Army's field artillery master gunner certification program as a guide for their own program. 7. Fullerton, MAJ Daryl L., "ANA Artillery: training the trainer", Fires, May-June 2009, pages 18-22. Grau, Lester W., Artillery and Counterinsurgency: The Soviet Experience in Afghanistan, Foreign Military Studies Office, Fort Leavenworth, KS, June 1997. Jackson, Joseph A., "Moving Artillery Forward: A Concept for the Fight in Afghanistan", Small Wars Journal, 2010. SGT Jesse Harrington, a Joint Fires Observer on an SFAAT advising the ANA in Logar province, provides assistance to ANA artillery D-30 soldiers during recent combat operations. (Photo SGT Bob Yarbrough). JRTC SFAAT ANA Artillery Resource Page. The link below will take you a JRTC (Fort Polk) webpage that provides documents and resources on ANA arty, the D-30 howitzer, a pub on 122mm ammunition, CAS Quick Ref Cards, D30 Range Table, D30 Smartbook, FDC Manual, and pictures of ANA artillery. You need to log in with a CAC to access the material. March 14, 2014. "Afghans prove proficiency in artillery training". DVIDS. 215th Corps soldiers complete a six-week D-30 122 mm howitzer instructor course at Camp Shorabak, Helmand province. March 5, 2014. "Afghan National Army Boost Artiller Skills". Posted on YouTube by British Forces News. ANA gunners train up in Helmand province. July 15, 2013. "Afghan Artillerymen Learn to Operate Russian D-30 Howitzer". DVIDS. Members of 4th Kandak, 2nd Bde, 203rd Corps fire their D-30 with help from 4/101. April 18, 2013. "Afghan Confidence". DVIDS. Video informs on the progress made by the ANA 205th Corps D-30 Howitzer crews. By Gail McCabe. April 14, 2013. "First Afghan Corps Level Artillery Fire". DVIDS. A video showing ANA soldiers from the 205th Corps at FOB Wolverine, Zabul firing D-30s. January 14, 2013. "Dialing in the D-30 Howitzer". NTM-A. This video talks about the D-30 fielding program for the Afghan National Army (ANA). September 15, 2012. "Afghan National Army D-30 Certification". DVIDS. ANA practice firing D-30s on Camp Clark, Khost province, Aghanistan. February 22, 2012. "Afghan National Army Artillery Training", NTM-A news release on YouTube accessed here. November 8, 2011. "ANA artillerymen set up and fire the D-30 122mm Howitzer". Video on YouTube.com. Marines from 1st Battalion, 12th Marine Regiment advise. September 25, 2011. "Afghan National Army rocks desert in first artillery shoot". YouTube. December 6, 2010. "JMRC trains on Soviet Era Russian D-30 Howitzer". YouTube.com. October 24, 2010. "ANA 4th Brigade's first indirect artillery practice". YouTube.com. The 1st Mentoring Task Force (Australia) helps ANA D-30 crews. December 6, 2017. "1st Brigade, 215th Corps soldiers end artillery course with a bang", DVIDS. An 8-week long training course was conducted at Camp Shorabak, Afghanistan - ending in December 2017. January 3, 2014. "First artillery training center unveiled in Afghanistan". DVIDS. The article presents information about the Regional Artillery Training Center in RC South (205th Hero Corps of the Afghan ANA) that opened at Camp Eagle, in Zabul province. September 13, 2013. "US team trains, certifies Afghan soldiers on the big guns". DVIDS. 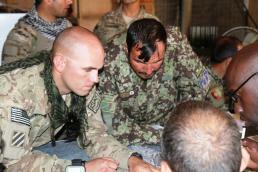 1LT Adam Roberts, D-30 training team leader from FOB Gamberi helps train Afghans. August 19, 2013. "Teaching the King of Battle". DVIDS. Soldiers from the 25th Field Artillery Regiment (4/10th Mountain) serving on the D-30 Mobile Field Artillery Training Team oversee Afghan artillery instructors in an ANA field artillery refresher course in Laghman province. July 28, 2013. "ANA soldiers provide safety through delivery of artillery fires". DVIDS. 4th Kandak, 2nd Brigade, 203rd Corps artillerymen getting proficient in providing fires. June 28, 2013. "Regional Corps Battle School now teaching artillery". DVIDS. ANA artillerymen learn the details of gun line, forward observer and fire direction center. June 5, 2013. 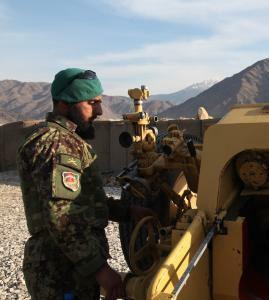 "Afghan artillerymen gain technological experience to improve firing ability". Regional Command East. Afghans learn to use the Afghan Gunnery Computer or AGC. May 19, 2013. "Small unit with a big mission". DVIDS. 2nd Bn 15th Field Artillery Regiment of 2/10 SFAB advises ANA D30 artillery platoons. May 12, 2013. "Afghan artillery soldiers support Operation Pamier". DVIDS. D-30 platoons from 203rd Corps based at FOB Orgun-E displaced to support ANA in Orgun and Bermal districts. Red 1 SFAAT from 2nd Bn 15th Field Artillery Regiment assists. April 19, 2013. "Afghan Army hones artillery skills". Australian Dept of Defense. Australian mentors help ANA from 4th Brigade 205th Corps with artillery proficiency. April 11, 2013. "ANA conducts corps-wide live-fire, cannoneers hit the mark". DVIDS. Advisors from Romania, Australia, U.S. and Slovak Republik assist. Seargeant Major Viorel Pruteanu, Romanian SFAAT, comments upon the ANA performance. April 7, 2013. "Artillery advising in Afghanistan". DVIDS. News story about advisors of the 2nd Bn 15th Field Artillery Regiment who work with D-30 Battery of the 203rd Corps at FOB Boris. The advisors, named "Red 1", prepared for their deployment at Fort Polk and attended the JMRC D-30 Course at Hohenfels, Germany. April 7, 2013. "ANA artillery live fire". DVIDS. News story about the ANA 205th Corps firing D-30s at FOB Wolverine. January 29, 2013. "Afghan troops train on D-30 Howitzer". Army.mil. SFAAT 5, 1st Bde, 101st Airborne Division assisted in training the ANA on D-30 howitzers at COP Monti. January 18, 2013. "Afghan artillerymen certified and ready to lead". DVIDS. 4th Kandak, 1st Bde, 203rd Corps fires D-30 at Camp Parsa, Afghanistan. December 24, 2012. "Artillery pieces falling into place for the Afghan National Army". Janes.com. 122 mm D-30 howitzers now deployed in Wardak and Logar provinces. December 31, 2012. 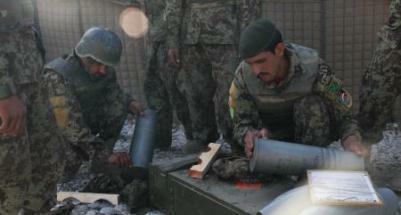 "Afghan troops hone D-30 skills in Laghman". RC East. December 18, 2012. "Training Afghan artillery teams a lesson in patience". Stars and Stripes. December 12, 2012. "Afghan troops receive D-30 artillery certifications". RC East News. October 17, 2012. 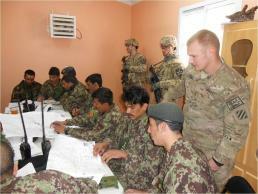 "Fort Campbell's Rakkasans strenghten Afghan relationship with Steel". Clarksville Online. July 16, 2012. "Afghan National Army soldier soars with Operation Eagle's Flight". Army.mil. 205th Corps ANA artillerymen conduct D-30 firing. June 8, 2012. "ANA artillery unit test fire first tactical rounds". army-technology.com. May 4, 2012. "Red Lions prepared to train ANA partners on D30 howitzers". DVIDS. January 12, 2012. "Afghan Army plans, executes artillery training". The Globe. December 19, 2011. "Canadians at KMTC: Working shoulder-to-shoulder with Afghan gunners". Government of Canada news release. November 7, 2011. "Picatinny strengthens Afghan self defense with D30 howitzer program". Picatinny Arsenal. This news article details the work done to provide D-30s to the Afghan army. October 24, 2011. "ANA artillery group conducts validation test". NTM-A News. After receiving training from an Artillery Mobile Training Team (AMTT) an element of the 209th Corps conducted an artillery fire demonstration. August 2011. "Afghan artillery fires first operational rounds in Paktika". ISAF News. August 3, 2011. "Howitzer recycling program comes to Afghanistan". Threat Matrix Blog. July 26, 2011. "French, Georgian soldieers meld to train Afghan Army artillerymen". NTM-A News. February 15, 2011. "Afghan National Army Artillery Soldiers Train on Howitzers". ISAF News. April 28, 2010. "Artillery mentors from the First Mentoring Task Force - Train an Artillery Battery of Afghan Gunners". Australia Department of Defence. May 6, 2009. "British Gunners Help Afghan Artillery Fire Up". Defence Talk. January 9, 2008. "U.S. Troops Mentor Afghan Artillery Platoon". American Forces Press Service. The 4-2 Embedded Training Team (ETT) trains up ANA artillerymen. 2. Some SFAAT team members and SFAB artillerymen are learning about the D-30 at Picatinny Arsenal. See Russian Guns Bolster Afghan Artillery, Global Defence Blog, November 12, 2011. 3. For more info on characteristics of 122-mm. D-30 Howitzer visit the following link. 4. See the Army Technology Live blog post dated December 14, 2011 for more about Picatinny Aresenal providing D-30s to the ANA at this link. 5. See "NGA Supports Afghan Mapping Initiative", Directions Magazine, January 11, 2008 for more info on NGA support to the Afghan Geodesy and Cartography Head Office (AGCHO) and the Afghan National Army (ANA). 6. The ANA G2 reportedly has the equipment, personnel, and organization to produce and distribute maps to lower echelon units. However, there is little evidence that these maps are actually being produced and getting distributed to the units doing the fighting. See "Afghan Army: Mapping their Future", NTM-A Facebook, March 20, 2010 for information on the ANA Intelligence Directorate (G2) Geographic Information/Intelligence Service (GEOINT). This ANA G2 element uses desktop computers with TalonView - a geospatial information services (GIS) visualization and production software suite (similar to FalconView). 7. Information about the master gunner taken from news story entitled "Afghan master gunner sustains artillery standards", DVIDS, August 9, 2013 at this link.